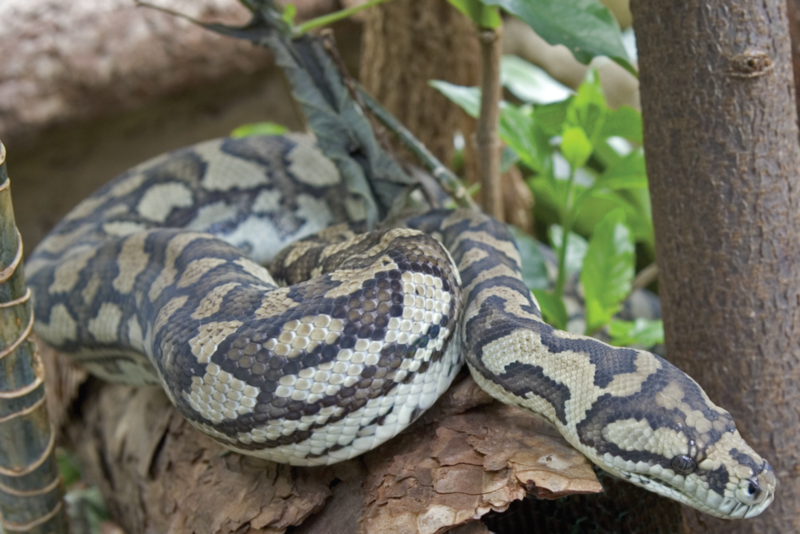 Carpet pythons are mainly found on mainland Australia. They live in a range of habitats, from rainforests to deserts. This species spends much of the day up in a tree but also comes down to the forest floor to hunt. Carpet pythons have heat receptors along their jaw to detect warm blooded animals even at night. They are “constrictors” and kill prey by preventing the heart from pumping as they squeeze the animal’s rib cage. Carpet pythons are popular pets due to their attractive markings. Individuals with striking patterns are bred together so that offspring will fetch a higher price. One of the subspecies is threatened with extinction in Victoria. Another subspecies is regarded as near threatened in Western Australia, due to loss of habitat.